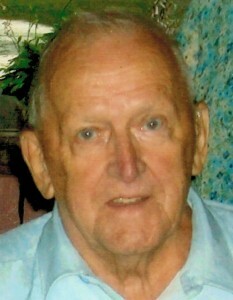 Jack G. Hammerbeck, 84, of Warren PA, died Monday evening, July 23, 2012, in UPMC Hamot, Erie PA following a brief illness. Born June 2, 1928 in Warren to the late Oscar and Jennie Genberg Hammerbeck, he was a lifelong resident of Warren. Following his 1946 graduation from Warren High School, he served in the U.S. Air Force as Airman First Class. Jack had been employed as a linesman with Penelec, retiring after 37 years as a meter reader. He was a member of the Warren Congregation of Kingdom Hall of Jehovah’s Witness. Jack was a member of the Warren Eagles Lodge #313 and enjoyed playing bingo. An outdoor enthusiast, he was a co-founder of the Farnsworth Trout Club and enjoyed hunting, fishing and gardening. Jack loved to travel and had an incredible sense of humor. He was a brilliant story teller and a flirt til’ the end. He is remembered as a man who always helped others. He is survived by his wife – Sandy Frederick, whom he married July 17, 2005; Four children – Jackie Johnson of Warren, Christy Lee Vettenberg and her husband, Lee of Jeanette, PA, Lori A. Corey and her husband, Bill of Warren, and Gerald “Garry” Hammerbeck and his wife, Linda of Warren; Two step-children – Vicky Ferrie and her husband, Tim of Scandia, PA and Lee Frederick of Buffalo, NY; a brother – Bob Hammerbeck and his wife Marge of North Warren, PA; Sisters in law – Luella Chase of Warren and Florence Robins of Spokane, WA; Brother in law – Rick Cuddy and his wife, Shirley of Spokane; 10 Grandchildren; 12 Great grandchildren; several step grandchildren, step great grandchildren, nieces and nephews. Jack is preceded in death by his first wife whom he married December 3, 1950 in Spokane – Peggy G. Hammerbeck, who died June 24, 2003; a son – William Hammerbeck; and 6 brothers – Ing, Bert, Sig, Donald, Ray and Leroy; and 4 sisters – Jean Nelson, Genevieve Phillips, Romaine Phillips and infant Ruth. i’m sorry I can’t come back for Uncle Jack’s funeral, but I’m with you in thought and prayer. My Dad loved his baby brother so much and your Dad was always there to help my Dad no matter what. Brotherly love exemplified. The world was a better place with your dad in it. His jokes, laughter and incredible sense of humor. Uncle Jack knew how to live life to the fullest, I loved him, admired him and appreciated what he did for our family. Here’s a toast to Mr Handsome! Love you guys! Just to let you know that our thoughts and prayers are with you at this time. It is hard to lose the one you love, but you have many memories to keep you going. Our thoughts and Prayers are with you all. Your Dad and Grandpa was one of a kind. Loved running into him at the Plaza. He loved his family very much. Condolences to the family. Jack was always fun to be around at get togethers we attended at Garry and Linda’s. Lori and family are in our prayers. Lori, We won’t be able to attend the funeral as tomorrow as I have a doctor appointment in Pittsburgh tomorrow. I didn’t know your Dad , but everything I have read about him he was a good man. We are sorry we could not make it back to Warren for the services. Our condolances to the entire family. May God grant you peace during this time of grief.